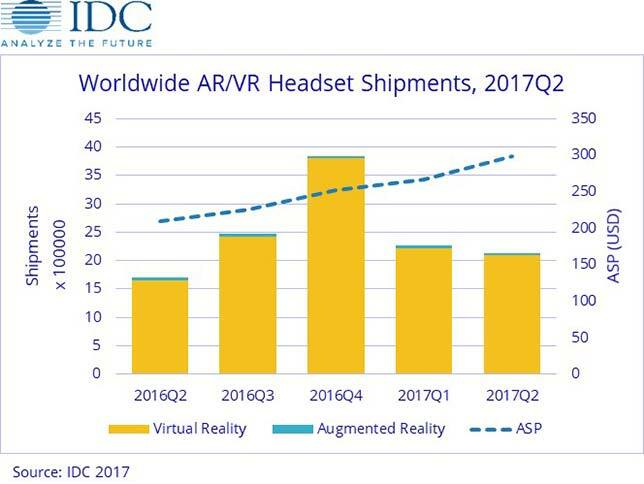 2.1 million augmented reality (AR) and virtual reality headsets shipped in the second quarter of 2017, a 25.5 percent increase compared to the same period of 2016, according to a new report from International Data Corp. (IDC). "Virtual reality products once again made up more than 98 percent of shipments in the combined AR/VR market," according to an IDC news release. "On the VR side, screenless viewers accounted for over half of all the headset shipments during the quarter. Tethered VR headsets captured 43 percent, up from the 34 percent in the previous quarter, driven in large part to Sony's ongoing success with the PlayStation VR (PSVR) and Oculus increasing shipment volumes thanks to price cuts. Meanwhile, in the still very small AR headset segment, shipments actually declined year over year as several consumer-focused products with big launches last year failed to sustain their volumes a year later. To date, the small but lucrative volume of success in AR headsets has been focused on the enterprise and that's likely to continue for the near term." "Consumer-focused AR headsets are still some way off, as most people will first experience AR through the screen on their phone," said Tom Mainelli, vice president of devices and AR/VR at IDC, in a prepared statement. "Now that Apple and Google are both focused on helping developers create AR experiences on their platforms — through ARKit for iOS and ARCore for Android — we can expect to see a flood of new AR apps appearing on smartphones later this year and into next. These developments should eventually lead to consumer-centric AR glasses, but that won't happen in meaningful volume, at affordable price points, for some time." Samsung led the market, with 568,000 shipments and a 26.7 percent market share. The company did see a year-over-year decline, according to IDC, though the release of the Galaxy S8 and S8+ helped push sales of the company's Gear VR. The new addition of a controller has improved the user experience and allowed the company to maintain its market-leading position despite a slightly higher than average selling price. Sony held the No. 2 spot with 519,400 shipments and a 24.4 percent share. "Demand for Sony's PSVR remained unmatched amongst the top tier of tethered headsets," according to IDC. "The launch of Farpoint along with the VR aim controller combined with some sustained demand for Resident Evil 7 boded well for Sony. Outside of gaming, Sony is also working on bringing other experiences to the VR platform by partnering with Hollywood creators. Despite its success, Sony still announced a modest price cut for the PSVR that should help drive sustained growth through the end of the year." Facebook's 246,900 sales was good for an 11 percent share and third place, sailing past HTC after reducing the price for Oculus from $599 to $499. TCL claimed 5 percent of the market with 106,400 shipments in the quarter. "The company has increased the number of models with which the [Alcatel] VR headset comes bundled, which means it continues to move significant volumes," according to information released by IDC. "A relatively weak platform and content ecosystem cast doubt on TCL's long-term prospects in the VR market, but there is no denying the company has done a good job of putting headsets into customers' hands." HTC rounded out the top five with 94,500 shipments and a 4.4 percent market share. "Stiff competition led HTC Vive to drop in the ranks," according to a news release. "However, the company managed flat growth over 2Q16 and captured 4.4 percent share during the current quarter. HTC is still one of the only major players successful at actively targeting the commercial VR market. On the consumer side, HTC recently announced a price reduction to $599, although that still leaves the headset priced well above rivals."